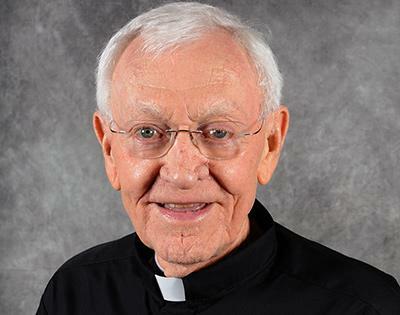 The parish community of St. Frances Cabrini shares news of the loss of its longtime pastor, Monsignor Robert D. Fuller. Preferring his priestly title of "Father Bob", he spent over 30 years in service to the Cabrini parish and over 50 years in the priesthood. A vigil service will take place on Thursday, Jan. 31, at St. Frances Cabrini Parish, 3201 E. Presidio Road, at 7 p.m. A Mass of Christian Burial will take place on Friday, Feb. 1 at 1 p.m. at St. Augustine Cathedral, 192 S. Stone Ave., with interment to follow at Holy Hope Cemetery, 3555 N. Oracle Road. An article on Father Bob's years of service to the church can be found on the Diocese of Tucson website. Below is also a tribute video that the diocese published along with the article. May Father Bob's soul and the souls of all the faithful departed, through the mercy of God, rest in peace. Amen.